High speed trolling for wahoo has become one of the most popular techniques for taking the ‘tiger of the sea’. Tom Gatch has over 20 years of experience as a writer focusing on saltwater fishing in Southern California and Baja. He authored the book "Hooked on Baja." The wahoo (Acanthocybium solandri) sits at the very top of the mackerel clan, just above the king mackerel, when it comes to popularity among serious offshore anglers. This toothy speedster, referred to by some as the ‘tiger of the sea’ can travel through the water at speeds of 60 miles per hour or more in order to overtake, mortally slash and devour their prey. Known as ‘ono’, which means ‘good to eat’ in the Hawaiian Islands, they are also a highly prized food fish that appears on the menus of discriminating restaurants around the globe. Although these well-respected gamesters generally inhabit tropical and subtropical waters, they will often migrate into temperate zones during the summertime. Wahoo tend to live solitary lives, although they will often hunt in small packs if it works to their advantage. When this occurs, there is not a single school of baitfish in the immediate area that remains safe. The hungry wahoo can sweep in so fast that they can quickly decimate the entire group before they even knew what hit them. The feeding frenzy that results from such an attack will draw gulls, pelicans and other predatory sea birds from all directions that will then descend and begin gorging themselves on the helpless forage from above. On a clear day, the melee that is created by such an event can be seen from miles away in the binoculars of skippers in who are in search of action. Once boats arrive at the scene, live bait can by cast into the churning waters for an almost instantaneous hook up. Often, however, anglers that are in search of wahoo must resort to trolling in order to connect with a brute wahoo; the IGFA World Record for the species now stands at 184 pounds. If you are simply trolling for fish in the hope of perhaps catching a wahoo, go ahead and do so at the standard speed of 7 to 8 knots and you may be successful. But, you will also probably hook up with a king mackerel, dolphinfish, tuna or other gamester. But if you are specifically targeting wahoo, you are going to have to troll much faster than that. 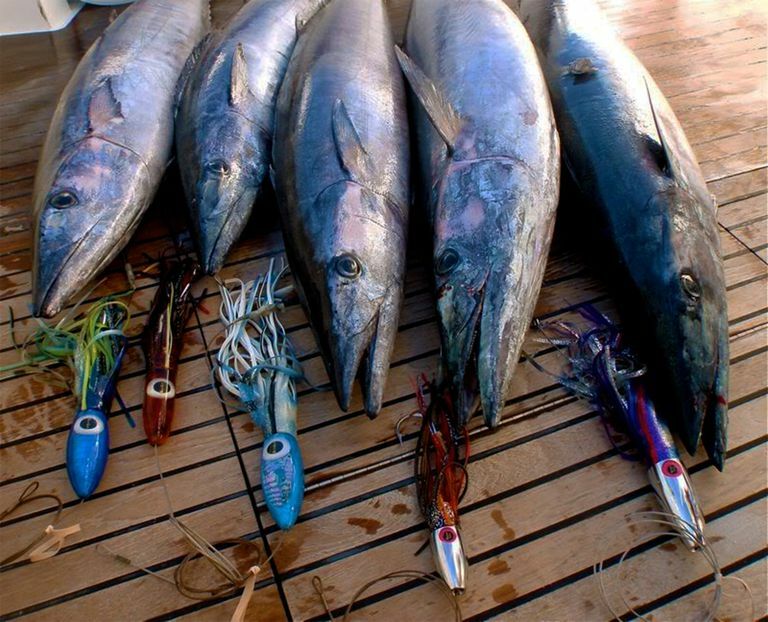 Depending upon prevailing weather and sea conditions, most sportfishing charter captains in search of wahoo will troll at speeds ranging between 12 and 22 knots in order to provoke a strike. These fish are highly aggressive, and there is usually no need to worry about them being spooked by your boat. Because of this fact, anglers are able to run their lures much closer to the transom than when trolling for many other species of gamefish. When it comes to the most productive wahoo lures, the Marauder has probably taken more of these fish than any other plug on the market. Wahoo bombs, which can either be purchased from a number of manufacturers or even be homemade, are also extremely effective. Perhaps most important overall factor is the speed at which the lure is trolled. Wahoo display a decided preference for specific colors; while natural baitfish patters can be effective on many occasions, more exotic color combinations like orange and black, purple and black or red and black get bit on a far more predictable basis. Always rig up with 12 to 15 inches of #12 wire to help ensure that your lure is not lost to the slashing teeth of the fish that attacks it. The most effective way to troll is by fishing a spread of 6 lures off your transom, which are set at specific distances from your boat. Try a combination of 100 feet, 200 feet and 300 feet on your port side and 250, 350 and 450 feet off the starboard. Focus your trolling activities around high spots, drop-offs and wherever bird activity is detected. Lastly, never have a false sense of economy when it comes to buying a rod and reel that is suited for catching wahoo, always select the best; this is one fish that you do not want to lose. What Are the Best Techniques for Trolling for Fish?